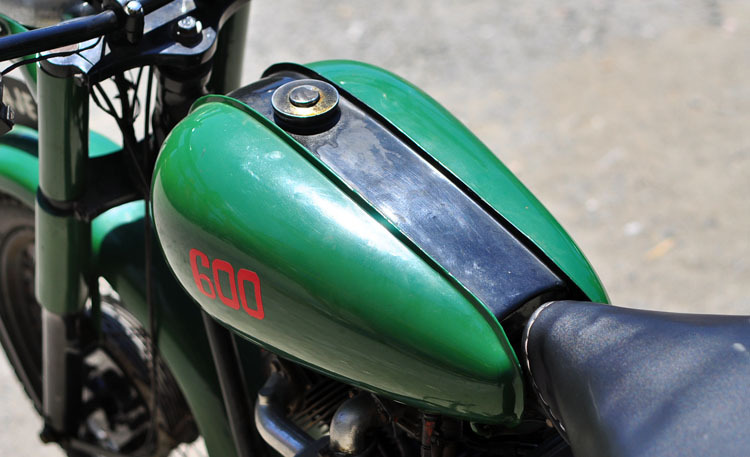 Do not be fooled by its form at the moment, that similar to the old-British motorcycle. Therefore, its original form was 1965 Mazda B600 mini car. Well, the Japanese automaker actually never ever developing a two-wheeled vehicle. These Japanese brand is better known as a car manufacturer, but if in the history, after the second world war Mazda ever been released the three-wheeled vehicles. But, thanks to the cold hands of Muhammad Mansyur aka Acung, the owner of Barokah Jaya Motor workshops located in Jl. 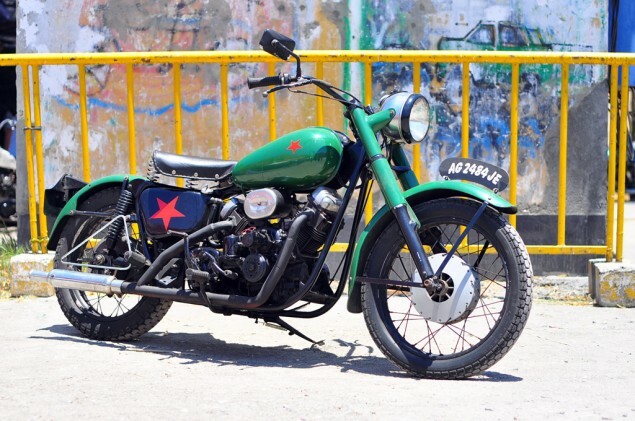 Amir Machmud No.1, Gunung Anyar Rungkut, Surabaya, the figure of Mazda B600 changed into a classic motorcycle. 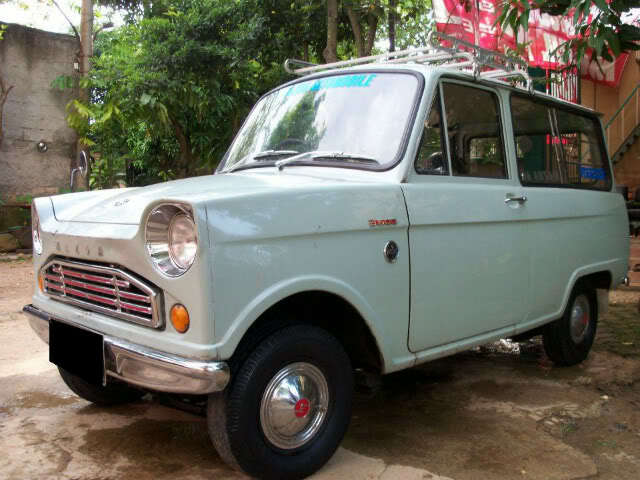 These unique modification ideas were recognized by the man who joined a local motorcycle club called the PEMUDI'S (Perkumpulan Montor Udhug Indonesia Surabaya), because he was not able to buy a classic motorcycle like those of his colleagues. "Want to buy a classic motorcycle is too expensive. That's why I have chosen this Mazda B600 engine to attach on the motorcycle chassis," said the eccentric man who took a year to build this motorbike. The first step taken after receiving the machine was designing the motorcycle chassis. "The custom chassis is made to look proportional to the dimensions of the B600 engine," he said further. And then the gearbox taken from an old Royal Enfield (RE) motorbike with a 4-speed transmission system. Interestingly, the position of the Royal Enfield transmission lever is on the right side, while the rear brake lever on the left. Apparently, the RE gearbox and B600 engine could not immediately be paired. Here the process of trial and error occurs. Because the position of the machine that originally installed transversely, but now must be made straight, or rotated 90 degrees. "So the position of the flywheel and clutch should be straightened. The flywheel should be adjusted as well, because the size was too big for a motorcycle," said Acung who working all the process of modifications in his workshop. Many obstacles were initially suffered from the coupling loose and chains loss because the engine position less straight. In addition, the use of drum brakes are sometimes not able to offset the amount of engine power. The next problems were the heat, "If it brought on slowly run, off course the heat of exhaust and the engine were felt on the feet. Understandably, it's an air-cooled engine originally". Along with time and continuous improvement, now the motorcycle had been more comfortable to ride, even Acung has taken it to the Jogjakarta without problems. Acung said the motorcycle is rarely used for daily due to heavy weight, and he also intends to add the engine cooling system. Once done with the engine and chassis, Acung began to pay attention to the bodywork. He was not taking the Harley-Davidson style with its famous V-Twin engine, but Acung chose the style of BSA C11 250 cc, an old British motorcycle. To that end, he designed custom body, tank, front and rear fenders based on the design of BSA C11 which was produced from 1939 to 1956. 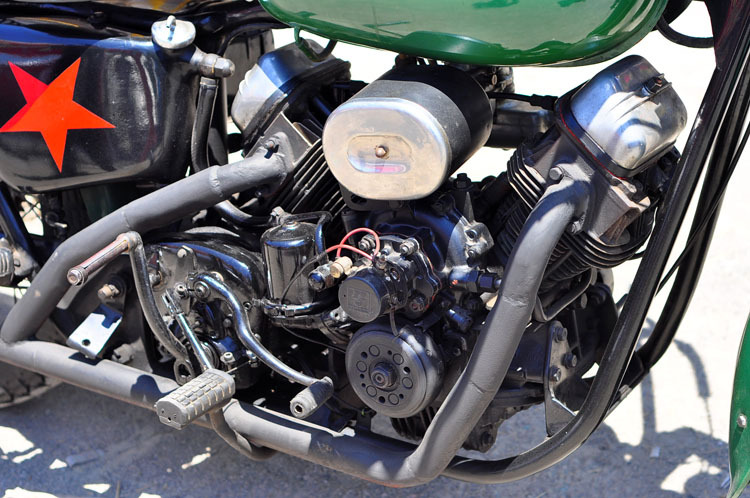 "The original parts of the BSA C11 was only the headlight and front drum brakes," he said.